As we all know, Thanksgiving is a day to give thanks to God for the many blessing we have had throughout the year. Most of the time, we tend to be thankful for the same things…family, friends, jobs, a home…just to name a few. Like most people, I am thankful for those things too, but this year Thanksgiving has taken on a different meaning for me. Along with the normal things to be thankful for, I am so thankful that I am not a widow. That could have easily been the case, but God gave me and my family a miracle just a little over a month ago. That miracle was that while my husband, Bob Schulenberg could have died of a “Widowmaker” heart attack, he did not…nor is he incapacitated in any way. 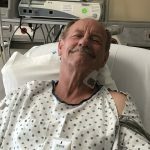 Bob’s miracle took the form of a number of Heaven sent people, who were in the exactly right place and the exactly right time to see Bob fall, come to his aid, perform CPR, and to add their prayers to mine, in our moment of urgency. Some of these people are really never at Walmart, where Bob fell in the parking lot, and yet God had orchestrated their unusual visit to happen at exactly the time it was need to save a life…my husband’s life. I have always known that God is on my side, but never was that fact made more clear to me than that Sunday afternoon. I had no idea what that shopping trip was going to end like. I had no idea that my faith, and the faith of so many other people was going to be called to action that day. There were no real warning signs…or at least not that we took as warning signs. Bob was a healthy man, with none of the normal risk factors for heart disease. we had just come from a walk at the mall and he had bowled 6 games in a tournament the day before…and took first place in singles. Nevertheless, right after we got our groceries, a clot lodged in his Left Anterior Descending Artery…the Widowmaker kind of incident, and down he went. While I should have been in a state of panic, oddly I was not. Yes, I felt worry over him, but everything happened so fast that there was no time to panic. There was work to be done,and Ginger Sims, a progressive care nurse at Wyoming Medical Center, stepped in just about a minute after the heart attack started, and took control of the situation. Her “take charge” mannerisms, took the fear out of the situation, and put the action into it. 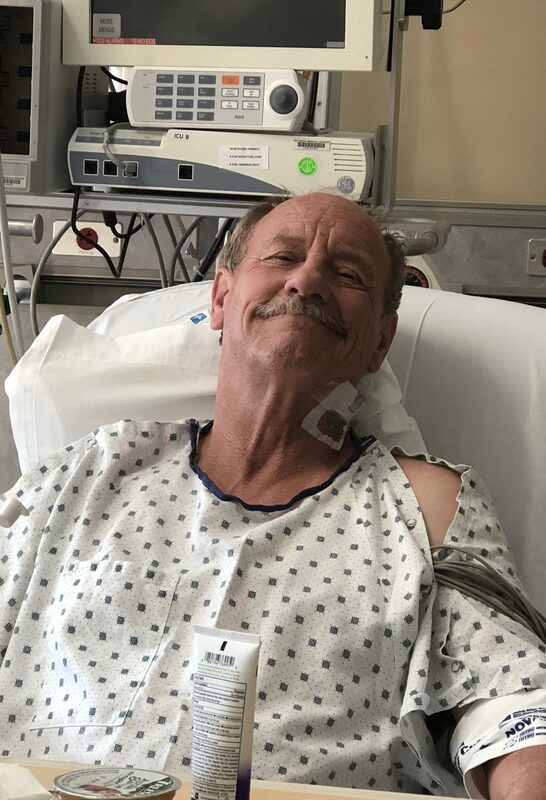 With the help of her friend, WMC surgical nurse, Valya Boycheva, and WMC transport worker, Laura Lance, CPR was administered immediately, and the blood flow in bob’s body was maintained throughout the entire event. Because God spoke to these people and put them at Walmart that day, Bob had an excellent outcome to what could have been a life ending event. After something like that, how can I possibly ever look at Thanksgiving in the same casual way I had before? The answer is that I can’t. God gave me a gift that is so amazing that I still have trouble wrapping my head around the events of that day, and just how blessed I am to still have my husband. There really is no way to totally make sense of it all, because it is bigger than the human mind can grasp. God is so good, and when he performs a miracle, it’s spectacular!! God doesn’t do things in a small way. He goes all out, and that is what he did for Bob. I can never thank God enough!! It’s been a whirlwind of activity, but much to be thankful for. Happy Thanksgiving everyone! !